1. Choose the CRM that’s right for your team and your business. CRM is NOT one size fits all. It is necessary to find a system you can customize to meet your business needs. If you need opportunity tracking and visual charts highlighting your customized sales funnels, then the system you invest in should be able to accomplish this process. Understand your process before you jump in with both feet. 2. Always be smart and organized with your data. Your data is your treasure chest. The information you collect about your leads and customers defines how you market or sell. Collect as much data as you can and keep it organized. Messy data means messy reporting. Messy reporting results in skewed numbers…and, well you get the point. 3. Find a CRM Champion to guide the team. Change and action requires a good leader, and CRM is no different. You need someone to master the system and take ownership of onboarding the entire team. 4. Do not jump right in with both feet, put one foot forward. As Dr. Leo Marvin say to Bill Murray in ‘What About Bob’, “Baby steps.” CRM implementation takes a plan. You can’t just go in adding contacts, setting up tags, workflows, and scoring without a PLAN. Establish your know how to sail the boat before you hit the high seas. 5. Share and collaborate with your comrades. The purpose of CRM is not just to house and track leads and customers, it is to assist in keeping things transparent and inspiring collaboration. Every person, from support to marketing should all be able to access the same data. They need to be able to view behaviors in order properly engage the contact. 6. Always use CRM with marketing automation. CRM should not standalone as it is much more powerful when backed by marketing automation. Whether you use apps like Zapier to integrate platforms, or choose to go for the gold and invest in an all-in-one platform, the two sides (sales and marketing) must talk and work with each other for ultimate effectiveness. 7. Do incorporate a social CRM into your overall CRM strategy. Social listening is an amazing sales tactic. Understanding what your leads and clients are saying about you, or how they are engaging with your brand is a powerful sales tool. Make sure your CRM integrates with social networks like LinkedIn and Twitter. 8. Ensure your team is actually using the CRM. CRM doesn’t work if you don’t use it. All teams should understand why they are using the platform and that it does make a difference in their overall productivity and ability to do their job. This ‘why’ comes with the training. You can also provide incentives for CRM use, such as Top Seller or Most CRM Activities completed. 9. Incorporate the data you gain into your overall strategies. 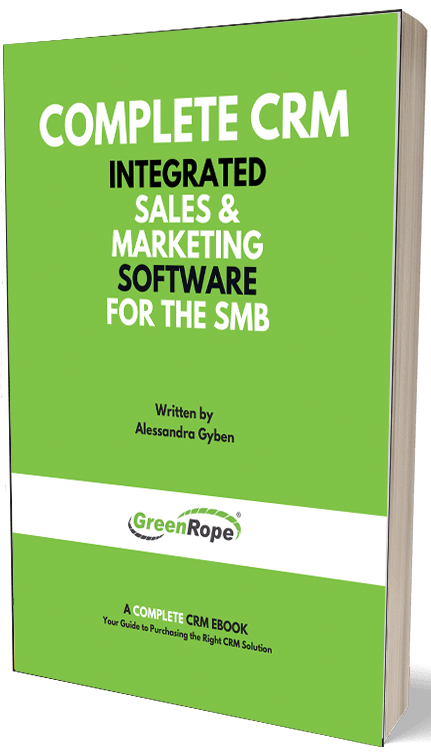 CRM, especially when married with marketing automation, gives a business a TON of invaluable data about the leads, customers, and overall business process. This data allows everyone on the team to be the best they can. Why? Because it’s like having a crystal ball. Use this data to sell more, refine strategies, and engage with your contacts. You CRM isn’t scary nor detrimental, it is helpful and acts as a sidekick to your abilities. It is the Robin to your batman, the jelly to your peanut butter. Treat it as such. If you let your CRM help you (by adding in all the right data and using it on a consistent basis), you will see the difference in your overall performance and the relationships you build with your clients. So, there you have it, the 10 Commandments of CRM. Do you have others that you think make the cut? Share them!